At the 41st Annual Connecticut Art Directors Club Design Show UConn Graphic Design & Design Center Studio received an unprecedented 17 total awards in the categories of Digital, Motion, Animation, Poster, Book and Identity Design. Here is a list of the all the awards our students and faculty received as well as links to the work. The poster series in this entry represents but one component of the multi-platform design system [print, digital, motion] that was conceived for the 2016 BFA exhibition announcing and promoting this yearly exhibition. I wanted to create a more simple illustration that would capture the tragedy of the story. I use the skull of the fallen king as the main focus point of the poster wearing a three point crown that represents his three daughters who drove him mad. Neighborways partners with communities to transform residential streets into low volume, low speed zones that are safe for children, pedestrians & cyclists. We were asked to design a modular mark & stencil system that could be developed over time. The animation is about using parts of the 1983 stamp to create a simple but emotional narrative depicting the form of communication. It relates to the stamp’s design in how it celebrates the year of telecommunication. Response to the brief Static-Kinetic. Deconstruct, then design and animate a narrative reveal for a two-dimensional stamp. 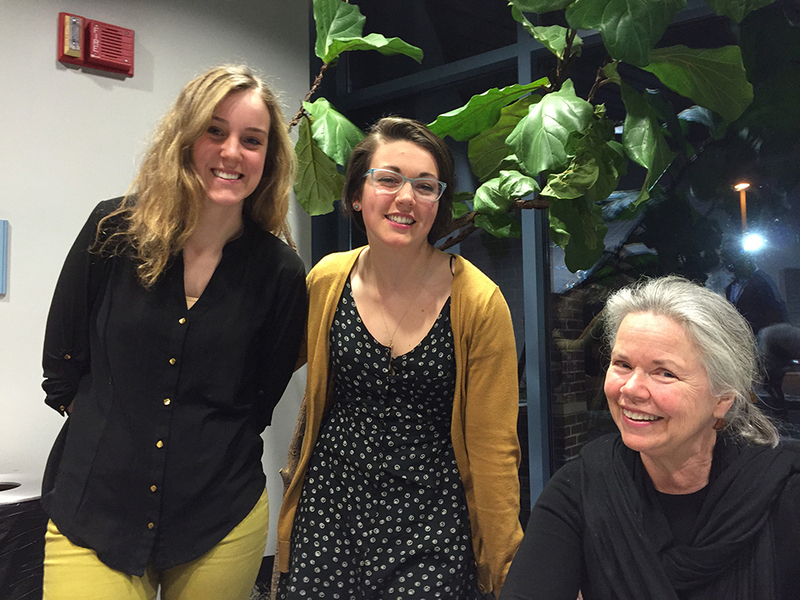 LRR is a joint creative effort between the UConn Graphic Design and the UConn Creative Writing Programs. It features literary and art works by graduate and undergraduate students and is produced by an exclusively undergraduate staff. Are We All Here? catalog was designed for the MFA Exhibition 2016 at UConn. The design is but one component of a larger identity system that was established for the exhibition alongside other deliverables in both print & digital platform. The visual identity presentation, as outlined in this document, established a very concise verbalization and visualization of the concept representing a new mark for the FIRST YEAR WRITING Program at UConn. The poster series along with other related collateral [both print & digital] were designed to promote a yearly auction that benefits the incoming MFA graduating class. All art auctioned was donated by student & faculty. 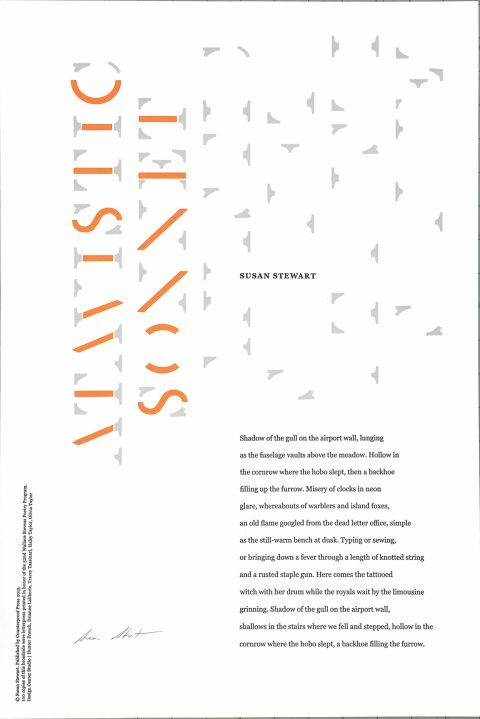 Each year, the Wallace Stevens Poetry Program is gifted with a new unpublished poem by a visiting poet which is designed & published by the Counterproof Press in a limited edition of 100 commemorating the event and the series. The UConn Department of Art and Art History is proud to announce the UConn MFA in Studio Art New York Thesis Exhibition at Sideshow Gallery in Brooklyn. The show includes works by Amanda Bulger, Don Burton, Kacie K. Davis, Neil Orians and Kamar Thomas. Works are in sculpture, installation, ceramics, painting, drawing, film and video art. 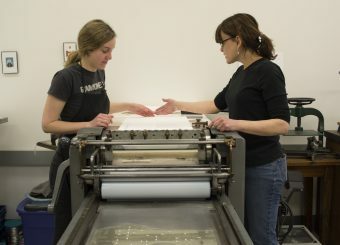 A limited-edition letterpress broadside was produced by the collaborative initiative, Counterproof Press, in an edition of 100. Students in the Design Center class created several designs, one of which was chosen to be produced. This has become an annual project to coincide with each year’s Creative Writing Department visiting Wallace Stevens Poet. UConn Today Features the MFA Exhibition: Are We All Here? The 2016 Masters of Fine Arts Exhibition: Are We All Here? opened on April 9th featuring work from our current Graduate students in The Department of Art and Art History. UConn Today wrote a piece about the show highlighting Sculptor Amanda Bulger and Painter Kamar Thomas, and exploring the differing inspiration behind their work. The article also mentions video work by Don Burton, installation pieces from Neil Daigle-Orians, and drawings by Kacie Davis. To see the article in its’ entirety go to UConn Today. The day is almost here! The 2016 BFA Exhibition begins tomorrow with an opening reception from 6pm-8pm in Artspace Windham Gallery at 480 Main St, Willimantic, Connecticut 06226. There will be work on display from our graduating seniors in Sculpture/Ceramics, Photography/Video, Painting/Drawing, Illustration/Animation, Graphic Design, and Printmaking, as well as food donated by local restaurants, and great music. Come out and support our Seniors, and enjoy projects that they have been working on all year. See the Facebook Page for all of the details! Here’s a look at our seniors setting up their work. This year’s Master of Fine Arts Exhibition is here! The exhibition will be in the William Benton Museum of Art at the University of Connecticut from April 9th – May 8th. There is an opening reception on Wednesday April 20th from 5pm-7pm. The exhibition features Amanda Bulger, Don Burton, Kacie Davis Kamar Thomas, and Neil Orians. Jensen received his MFA from UConn in 2008. Since then he has become a MacDowell Fellow, participated in residencies at the Queens Museum, Lower Manhattan Cultural Council, Wave Hill, and Kimmel Harding Nelson Center for the Arts. He has had exhibitions in The National Gallery of Art in Washington D.C. and The Metropolitan Museum of Art, and has been featured in The New Yorker. 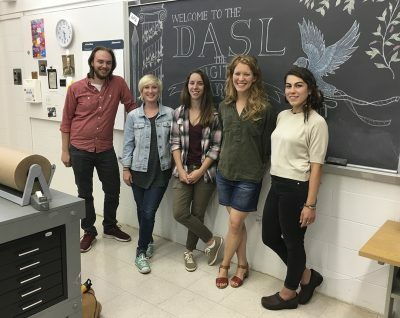 2015 Graduate of the School of Fine Arts, with a concentration in Illustration, Nicole Horsman has been featured in the 40th Anniversary Atlanta Film Festival. She screened her stop-motion animation “Klaus” on April 6th. “Klaus” began as her Senior Project work, completed for the April 2015 BFA Exhibition. “Klaus” was featured in a showcase entitled “Touch of the Puppet Head” which featured live puppetry performances alongside several films. 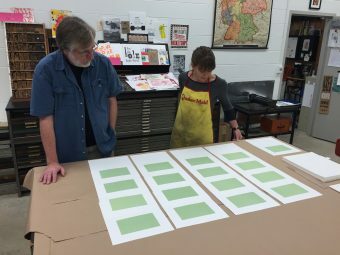 Professor Laurie Sloan, printmaker and founder of our own Counterproof Press, has a great show of images fusing digital technology and traditional screenprinting for the month of April (in Hartford, at EBK Gallery). 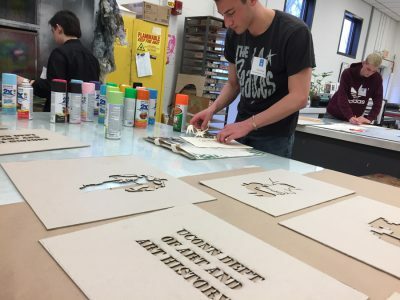 Plus she’s getting some serious ink (pun intended) in “Two Coats of Paint,” Sharon Butler’s well-respected blog about fine arts. Check out more Professor Sloan’s work here. 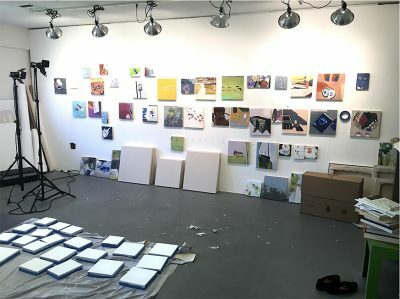 Sloan says her process, which involves fusing digital technology and traditional screen printing techniques, is like that of a naïve (or irresponsible) scientist who tests hypotheses, executes experiments, and injects random occurrence into established order. A fragment may become a tail, a claw, or an ear depending on the context. At first glance, the black and white images, loosely conjuring woodblock prints from medieval manuscripts, seem abstract and graphic, but over time, they gain resonance as steady, accusing eyes seem to emerge from the dark masses. Sloan works the images until, as she says, they have the odd quality of agency but also feel like victims. Sloan’s monsters, like Grendel in Beowulf are powerful and dangerous but at the same time targeted and vulnerable. “Laurie Sloan,” curated by Sharon Butler. EBK Gallery, Hartford, CT. April 1- April 30, 2016. Opening reception Saturday, April 2, 6-9pm. Brendan’s research consists of examining cancer susceptibility and progression in a non-traditional mammalian model, specifically, the Peromyscus leucopus, or white-footed mouse. Working with an inbred line of P. leucopus found to be highly susceptible to developing an adenocarcinoma (cancer from a glandular origin) of the Harderian gland, the project seeks to determine what genetic signatures are present in the inbred mice line that predispose them to developing this cancer, and also what makes it so highly metastatic, since metastasis is usually the cause of death in most cancer-related fatalities. Along with a BA and MA in Biology, Brendan is also receiving a second degree in Art History from the UConn School of Fine Arts. A native of Montana, Baldridge lives and works in Brooklyn, NY. His work often satires the mainstreaming of countercultures and the glorification of escapist entertainment. Printmaking and photography dominate Baldridge’s work methods where process often acts as a foil within the narrative. 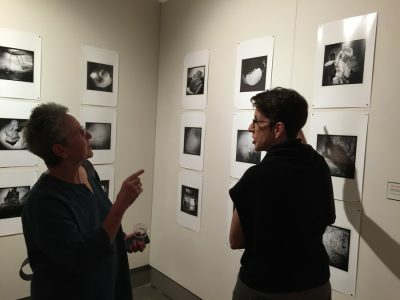 Junior BFA student concentrating in Graphic Design, Raeanne Nuzzo of New Haven, CT has received an IDEA Grant for a project that she is working on along side Professor Mary Banas, entitled Fear. The project is set to be shown in the Fall in the Visual Art Installation Space at the School of Fine Arts. Fear: The Culture is an interactive poster design project, featuring the phrase “Something really dangerous is going on,” a quote from Donald Trump, paired with the hashtag “#FearTheCulture” printed over a variety of images from sensationalized media as a method to critique the American culture of fear. 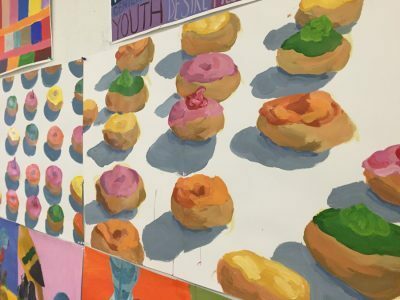 The posters will be hung publicly over the summer, and reactions will be documented and catalogued along with the original source materials, culminating in a complete documentation and exhibition of the work in VAIS Gallery in Fall 2016. The MFA Students of UConn proudly invite you to the 2016 Spring Semester Open Studios Event! There will be food, music, art and a chance to learn more about each MFA student’s work. Thursday March 10th from 7-9PM at the Visual Arts Research Center (VARC) located on UConn’s Depot Campus in the Lebanon and Colchester buildings. The VARC is located on the UConn Depot Campus, just off Rt. 44. *BY CAR: From 195, take Rt 44 West. At the stoplight next to the former prison, make a left onto Walters Avenue. Stay right at the fork to merge onto Ahern Lane. Just past the abandoned buildings, you should see Lebanon Cottage and a blue sign that says “Visual Arts Research Center.” Parking is FREE. Ted Efremoff, assistant professor of art at Central Connecticut State University and a 2006 graduate of the UConn MFA Studio Art program, will discuss his artist work on March 4, 2016 at 12:00pm at the MFA Graduate Studios (VARC) on the Depot campus. Efremoff born in Moscow, Russia, is a cross-disciplinary artist engaged with performance, video, installation and social practice. Spurred by his personal interest in social justice, he envisions collaborative activity as an instrument that builds critical relationships between people. His art explores the personal and cultural constraints ingrained within prevailing political, economic, and social power structures. Efremoff has performed and exhibited nationally at Chashama performance spaces, Sideshow and PSII Galleries in New York City, The Museum of American Art in Philadelphia and the Benton and Mattatuck museums in Connecticut. Internationally his work has been seen at the Gongju National Museum in South Korea, The National Center of Contemporary Art in Moscow, Russia and The National Palace of Culture in Sofia, Bulgaria. His work is in the collections of the Sound Museum of Rome, The Los Angeles Center for Digital Arts and the Culture House of Bad Sobernheim, Germany. 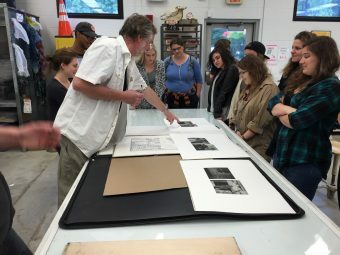 John Schulz, artist/printmaker who teaches at the School of the Museum of Fine Arts, gave a great lecture and showed prints to students in the printshop. He was a 2015 Counterproof Press visiting artist. 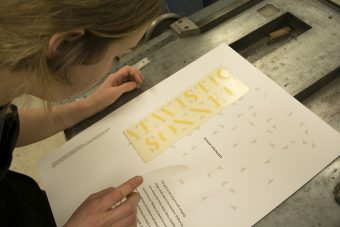 Schulz worked with Counterproof Press to create and edition a suite of five wonderful letterpress prints. Turning to cast-off images from books, magazines, comics, catalogues, and printed detritus, Jon Schulz’s work investigates and transforms common symbols and images from the “low” end of visual culture via chance operations, cut-ups, and an ironic visual language, conveying a sense of loss and psychic anxiety that reflects the uncertainty of memory and contemporary life. 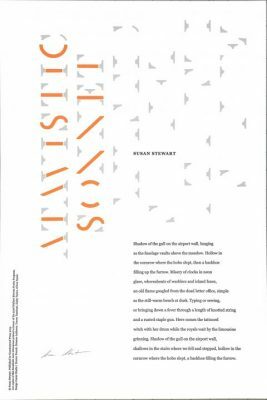 A limited edition letterpress broadside of visiting poet Susan Stewart’s poem, “Atavistic Sonnet” was published under the Art and Art History department’s Counterproof Press. Design Center students designed and helped to print the edition. Susan Stewart gave a poetry reading as part of her visit to the university, sponsored by UConn’s Wallace Stevens Poetry Program. 2014 MFA Graduate, Micah Cash, has recently announced that he will be publishing a book on a project he worked on while at The University of Connecticut. His website states the series Dangerous Waters investigates the landscapes and contemporary social impact of the Tennessee Valley Authority’s (TVA) hydroelectric program. These photographs explore the tenuous balance between landscapes designed for hydroelectric generation and public recreation. While these dams have become symbols of social and economic prosperity, they also remain visual reminders of loss, population removal, and eminent domain. The ecological and personal sacrifices are privately internalized and the social benefits publicly celebrated. Recently, Professor and painter, Deborah Dancy, sat down with Jeff Edwards of ArtPulse Magazine to discuss the numerous bodies of work featured on her website, deborahdancy.com. To read the article in its entirety click here: Art Pulse No. 24 | Vol. 7 | 2015.